Historically, how closely correlated are U.S. real estate price performance and U.S. stock market price performance? ForumsArrowGeneral Real Estate InvestingArrowHistorically, how closely correlated are U.S. real estate price performance and U.S. stock market price performance? And has any historical correlation been coincidental or is there a theory of why real estate price movements and stock market price movements would be correlated? I'm referring to U.S. real estate as a whole and the U.S. stock market as a whole, not specific geographies (e.g., Los Angeles) or companies (e.g., Netflix) or industries (e.g., tech). Great question, but probably very complicated answer because the real estate industry is so intertwined with the rest of the economy. I'd say if you want to find the answer to this question, you need to pin down what aspect of the RE market you want to compare against the stock market. For simplicity sake, let's assume you care about pricing (appreciation). For this, we can use the very popular S&P / Case-Shiller Home Price Indices. 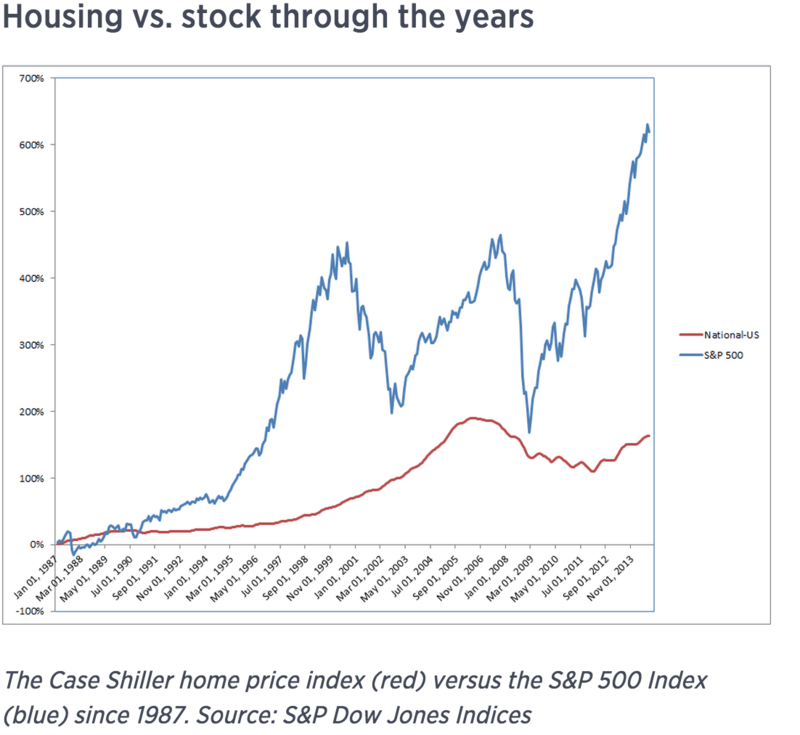 As you can see, based on the image, the stock market has appreciated quite a bit more than the home price index. However, there are many caveats to consider. In an article from MSNBC last year, Where to put your cash? A house or a stock, economist discuss the advantages / disadvantages to investing in one asset vs the other. The article does a great job, in my opinion, of drawing a comparison between the two investment strategies. Definitely worth a read. It's a riskier choice [investing in housing], given the current volatility in home prices, but it may be the best way to build wealth. My opinion? Do both. Diversify by investing across multiple asset classes. Where do you park your extra cash while waiting for stocks to cheapen and/or real estate to dip again? It's market specific but I still think real estate has another 3-5 years of solid run-up. There were several years where we had very little construction which has lead to pent up demand. I have been putting my cash into single family rentals in various markets across the country. These platforms also do tax-loss harvesting. My 401K and IRAs are invested aggressively in stocks (and < 10% bonds) via a mix of Domestic and Foreign ETF's / Mutual Funds. And for real estate investing, I have a decent amount in one IRA invested in notes at about avg 9% annualized return. I made these investments through a RE crowdfunding platform. I use my online savings (money market) and the algorithmic trading platforms as my reserves for opportunistic real estate buys (downpayment, funds for flipping, etc). Next week when my car is paid off, I'll be completely debt free. Otherwise, I'd be paying down debt at a rate which increases my cash flow, but not so fast that I lose out on the possible opportunity-cost of having cash on-hand. For our cash-flow properties, we're putting 100% of the returns right back into paying off the principal on the loans. As you can see, I'm diversified across platforms, asset classes, foreign, domestic, stocks, bonds and I try to ensure that I don't keep too much liquid cash so that I'm maximizing my earnings. I've never traded on margin because I don't follow stocks or my own portfolio that frequently. I'm in this for the long haul and aside from period checking-in and adjustments, I'm banking on long-term compounding growth for retirement. The house your buying has some deferred maintenance if I heard from Cat correctly. I'd take care of all the low-hanging fruit so that you can maximize your rents and save yourself headaches. Since your buying this house owner-occupied, you'll most likely need 20-25% down on your next investment property. Depending on how soon you plan to buy that next property would dictate how I allocated those additional assets. Have you made your max 401K or IRA contribution for the year? You should do that so that you can get the tax savings. If yes, and you plan to start looking for your next investment: keep the money in a money market so that it is liquid for your down payment. If your purchase is going to be > 6 months from now: keep some money liquid, the rest I would put back into the market in low-med risk assets (bonds, large cap, etc). The house has some inherent advantages over other investments, namely the mortgage tax deduction and ability to leverage up to 90% (or more) at longer terms. It's really hard to beat that. Basically the government is subsidizing the residential real estate market, arguably more than any other industry. Regardless of whether or not this is good for our country, it's hard to ignore that. If you have only one asset, it should be a home but I would make sure you max out the benefits on 401K too. Logan A. and I also really want to continue to grow her sales business and I'd like to eventually make my career real estate development or co-founding the next great real estate + tech startup. But in the words of Mark Cuban, you have to crawl before you ball. So I'm trying to build as much experience in the meantime and develop my network as much as I can. Never hurts to also invest in your real estate education along the way. UCLA has a Real Estate Certificate I may go for just for fun and I'm a couple of months from having my brokers license. Thanks, totally understand your reticence re: your former company. Wow, I had no idea one could fudge the accreditation requirements. And yeah, with equities, I'd just rather self-manage. 1%/yr over 10 years is 10% of my cost basis as well as a chunk of my appreciation...2%/yr over 10 years is 20%...all assuming a lump-sum investment on Day 1 of course...I'd rather be hands-on and hold onto that 10 or 20% rather than losing it to practically non-deductible fees. Thanks for mentioning the Small Lot Ordinance...never heard of it and not sure if I can take advantage of it but it's good reading material on the train tonight...and good for future reference. And I totally agree with your thoughts re: LA long-term...LA has never been able to build enough, and there's no reason to believe it will be able to any time soon. You said, "building and adding square footage is where to make your bets right now"...what does this look like for the little guy (like me) with little capital and no experience? And let me know if you come up with the next big startup...I want in! Logan A. I don't think there is any direct correlation at all. Both are tied to larger economic cycles and correlate more with interest rates, money supply and economic expansion. I had an economist on my radio show that does a great job of explaining this. He actually predicted the 2008 great recession 11 years before it occurred. He's going to be on the show again next week, but you can listen to a podcast of the 8-2-2014 show on my website. You mentioned that P2P lending is "too expensive right now". I'm curious to hear why you feel that way? For me, that's not been my experience. Rates have come down a little bit, but I'm still earning 7 to 9%, via The Lendingclub.